On a small island in the middle of the ocean, there once lived a forgotten tribe. The inhabitants of the island lived a carefree and quiet life and everything seemed to be perfect, until one day a great volcano woke up. As the sky spewed lava and ash, the villagers abandoned their homes and ran for their lives. They headed for the ocean, making their way through treacherous mountains, wild jungle and deep swamps in order to escape from the island. 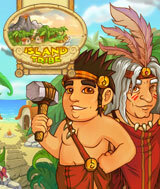 Help the settlers reach the ocean before the volcano strikes its final blow and hot lava gulps the island down. Be careful and watch every step of yours, since the dense, wild jungle is covered with clouds of thick, ashy fog and full of dangers. Construct buildings, collect resources and restore magic totems to clear up your way and help the tribe escape from the island! Comments: When I first played this game, I thought it was boring. The more I played, the more I liked it. I'm hooked. Comments: This time amnagement game was a lot of fun and relatively easy to play. Your little characters run all over clearing the way for you to build and recreate your tribe. You get to go to the snow, and venture in to lots of areas and build balloons and sleds. It was fun.